The Santorini group of islands is unique as it is probably the only volcano in the world with its caldera in the sea. All of Santorini’s islands were formed largely due to the volcanic activity and constitute a compound volcano. Twelve huge explosions occurred, one every 20.000 years approximately, during the last period of volcanism. Each violent explosion caused the collapse of the volcano’s central part and the creation of a large crater (caldera). The volcano however managed to recreate itself over and over again. The last large explosion occurred 3.600 years ago (during the Minoan Age) when the igneous material (mainly ash, pumice and lava stones) covered the three islands (Thera, Thirasia and Aspronisi) together with a thriving prehistoric civilization, evidence of which was found during the excavations of Akrotiri in Thera. The huge amount of new matter did not only create stretches of flat fertile land, but it is also responsible for the formation of the well-known external beaches. The solid material and gases emerging from the volcano’s interior created a big “vacuum” underneath. This caused the collapse of the central part and the creation of an enormous “pot” – the today’s Caldera – with a size of 8×4 km and a depth of up to 400 m below the sea level. Following this explosion, the volcanic activity continued through time with slower pace, building two islets inside the Caldera, the Palea (Old) and Nea (New) Kameni. The latter is the newest land in the Mediterranean as it was formed by lava between 434 and 57 years ago. The round craters, hot fumaroles, new minerals, and gushing warm multi-coloured water, impress visitors. The collapse of the central part of the volcano created the Caldera’s slopes and cliffs, “gremna” as local called them, and it is possible for visitors to take a tour by sea within the “internal” part-the offspring of the active volcano. In this way one may come close to the volcano and get a very realistic picture of its slopes, which stretch in a total length of 25 km and reach a height of 100-300 m above the sea level, acquiring a better understanding of its development and the way in which the volcano acted. The variety of rocks, the alternation of their colours, the way in which they relate to each other and the details of the volcanic shaping are all extremely impressive. The natural light that falls on the slopes is different each moment of the day and offers unique views throughout the year. The view from the sea is made complete thanks to various routes in land, close to the Caldera rim. 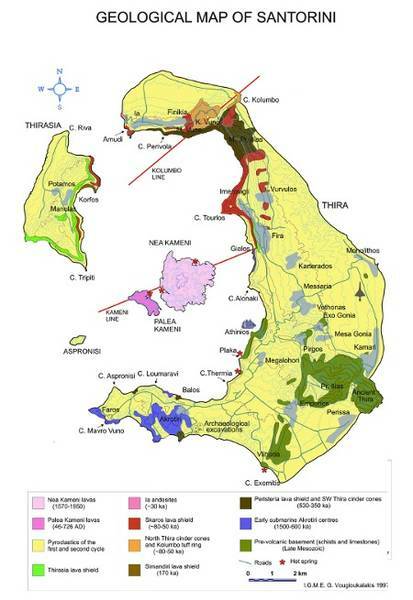 In addition, some of the natural cross-sections and the old quarries on the two larger islands (Thera and Thirasia) offer the opportunity for observation, consolidation and finally the delight of experiencing a wide range of geological structures and forms. Finally, the panoramic view from various points at the top of the caldera helps the imagination to comprehend the phenomena and simplify the historic evolution of the volcanic events on the two Kameni islands. It is clear that a huge natural geological-volcanological museum has been created in Santorini, ideal for observing the structural formation and development of a classic volcano, easy to explore and providing an alluring invitation into the world of volcanology. It offers for free a colored, three-dimensional open “window” which is accessible not only to specialists but to all visitors of the island.